July 31st, 2018 – Middelharnis, The Netherlands – For three and a half years now, OPNsense is driving innovation through modularising and hardening the open source firewall, with simple and reliable firmware upgrades, multi-language support, HardenedBSD security, fast adoption of upstream software updates as well as clear and stable 2-Clause BSD licensing. 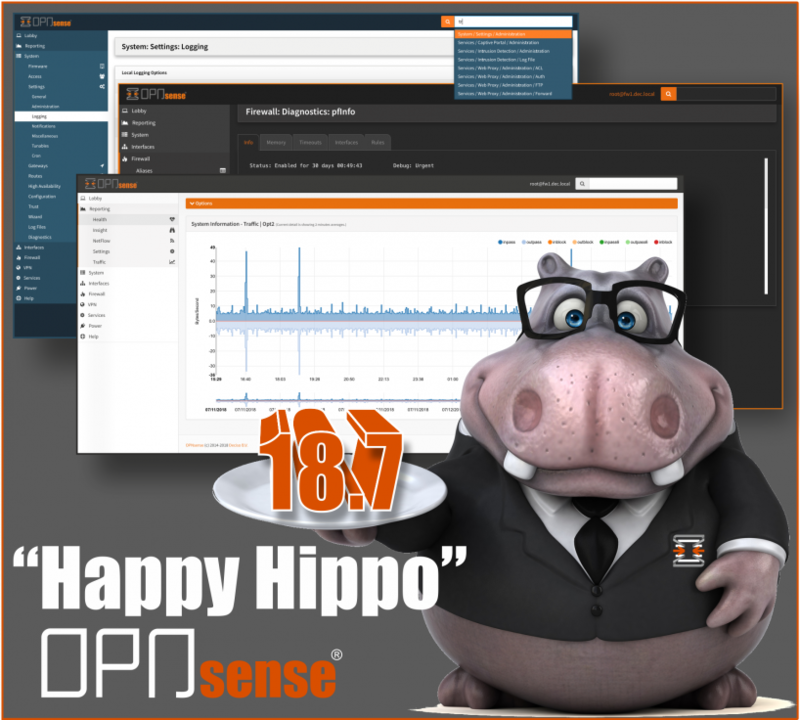 Deciso is proud to announce the immediate availability of version 18.7 nicknamed “Happy Hippo”. This release shows the power of open source software and a lively community. More than ever the involvement of our community is visible in the work that has been done since the previous release. This is where the structured development and the modular design really pays off. Our friendly and helpful OPNsense community has grown significantly, for example the number of forum visitors has doubled in the past year. This new major release offers users a considerable amount of IPv6 connectivity improvements including 6RD support, greater multi-WAN stability, an extensible backup framework with Nextcloud support, latest Intel NIC drivers and the core integration of Monit for fine-grained system monitoring. Developer support has been improved with the easily accessible API documentation and tools to support local frontend development. New plugins in this major release include e.g. Telegraf (agent for collecting and reporting), NUT (Network UPS tools), OpenConnect client, Shadowsocks (secure SOCKS proxy), Net-SNMP (SNMP daemon) and several themes. Our team believes that open source improves knowledge sharing and helps to build better products.